The Hidden Springs Resort is a unique Planned Unit Development located in the beautiful Smoky Mountains of East Tennessee near Gatlinburg and the visitor attractions. The Resort, managed by Sentry, is comprised of 177 individually owned short-term rental cabins, a heated pool and a soon to be added clubhouse. Hidden Springs is unique, with no owner-occupied units. Homeowners all own units for investment purposes. The development has its water and sewer utility services to the community, billed separately from HOA dues. On-site staff maintains the community from fixing roads to cutting back vegetation. 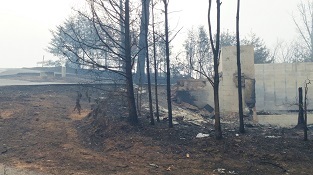 On November 28, 2016, Hidden Springs was ravished by a major forest fire. Twenty-three cabins were lost. The water filtration building burned. Many trees were consumed and a significant portion of the landscaping charred. Rebuilding began immediately. First, the Sentry Community Manager contacted every owner. In some cases, the Manager gave the owners the first news of their loss in the fire. Next, vendors were brought in to secure the Resort and haul out the fire debris. Simultaneously, insurance claims were filed and supporting documentation gathered. Over the intervening year, the Board has spent a huge amount of time focused on restoring the Resort. Their effectiveness and commitment has been amazing. Also, the maintenance staff has been phenomenal. They have used their historical knowledge of the property to rebuild the water building, fix lines, and build a temporary pavilion for guests to enjoy the outdoor pool area. Without the maintenance staff, it would have been hard to get things back to normal so quickly or keep costs within budget. It has been an honor and privilege for Sentry Management to work with the dedicated board, helpful homeowners and capable staff of Hidden Springs Resort.